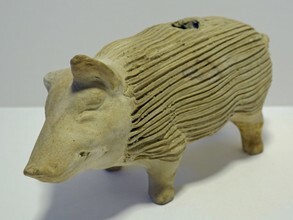 This particular piggy was excavated from a Victorian bottle dump in the 1970's in Lincoln (UK). Which is particularly amazing as it came out in one piece! The Victorian period was from 1837 until 1901. •	Look out for areas with nettles, elderberries and rosebay willow herbs, which thrive in ash-filled soil.